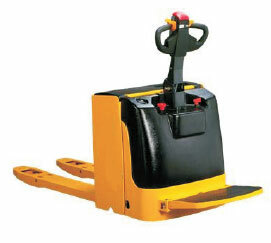 We hold expertise in manufacturing, exporting and supplying Electric Pallet Truck. The Electric Pallet Truck, we provide are designed by the experts and engineered by one of the best team of engineers. Highly efficient in performance and loaded with excellent features, the Electric Pallet Truck is demanded widely by the clients all across the globe. Integrated Hydraulic power unit is coming from BUCHER. It integrated DC motor, gear pump, valve and relevant pipe, thus it can work with high reliability, stability, low power consumption, energy saving, low noise and environment protection. CURTIS electronic accessory made in America. We applied CURTIS electronic accessories in our products. The electronic controller has many functions such as regenerative braking, inverse braking and steeple timing, etc. The dependability is excellent. Integral uprightness installation separately excited traction motor, with Lenze electronic magnetic spring loaded brake. Import gearbox and drive wheels super-excellent capability, steady and credible quality. Maneuverable and compact through small chassis dimension. Fully maneuverable with tiller in upright position through crawl speed button.